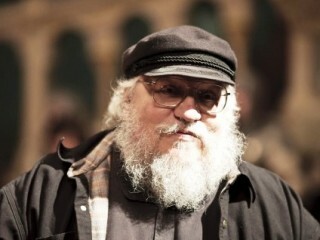 George Raymond Richard Martin is an American science fiction and horror author, sometimes referred to as GRRM. He is also a screenwriter of fantasy and become famous for his bestselling work A Song of Ice and Fire,a series of epic fantasy novels that HBO adapted for their dramatic pay-cable series Game of Thrones. As a youth, Martin became an avid reader and collector of comic books. Fantastic Four #20 (Nov 1963) features a letter to the editor he wrote while in high school. He credits the attention he received from this letter, as well as his following interest in fanzines, with his interest in becoming a writer. Martin wrote short fiction in the early 1970s, and won several Hugo Awards and Nebula Awards before he began writing novels late in the decade. Although much of his work is fantasy or horror, a number of his earlier works are science fiction occurring in a loosely-defined future history, known informally as 'The Thousand Worlds'. He has also written at least one piece of political-military fiction, "Night of the Vampyres", collected in Harry Turtledove's anthology The Best Military Science Fiction of the 20th Century. In the 1980s he turned to work in television and as a book editor. On television, he worked on the new Twilight Zone and Beauty and the Beast series. As an editor, he oversaw the lengthy Wild Cards cycle, which took place in a shared universe in which an alien virus bestowed strange powers or disfigurements on a slice of humanity during World War II, affecting the history of the world thereafter (the premise was inspired by comic book superheroes and a Superworld superhero role-playing game of which Martin was gamemaster). Contributors to the Wild Cards series included Stephen Leigh, Lewis Shiner, Howard Waldrop, Walter Jon Williams and Roger Zelazny. His own contributions to the series often featured Thomas Tudbury, "The Great and Powerful Turtle", a powerful psychokinetic whose flying "shell" consisted of an armored VW Beetle. Martin's short story of the same name was adapted into the feature film Nightflyers (1987). In 1996 Martin returned to writing novel-length stories, beginning his lengthy cycle A Song of Ice and Fire (ostensibly inspired by the Wars of the Roses and Ivanhoe), which is projected to run to seven volumes. In November of 2005, A Feast for Crows, the fourth book in this series, became The New York Times #1 Bestseller and also achieved #1 ranking on The Wall Street Journal bestseller list. As the years passed, Martin's progress on the fifth book, A Dance With Dragons, slowed. Fans began to gnash their teeth and publicly complain in internet forums and specially created fan sites, cursing Martin while praising his work. The announcement of the 2011 publication of A Dance With Dragons was welcome news for readers, as was the 2011 cable television production of A Game of Thrones. Martin was selected by Time magazine as one of the "2011 Time 100," a list of the "most influential people in the world." 1979: Hugo Award nominee, 1978; British Fantasy Award nominee - "Dying of the Light"
1982: Locus SF Award nominee "Windhaven"
1983: Locus SF and World Fantasy Award nominee "Fevre Dream"
1984: Locus SF and World Fantasy Award nominee "The Armageddon Rag"
1997: Locus Fantasy Award winner, Nebula and World Fantasy Award nominee - "A Game of Thrones"
1999: Locus Fantasy Award winner, Nebula Award nominee "A Clash of Kings"
2001: Locus Fantasy Award winner, Hugo and Nebula Awards nominee "A Storm of Swords"
2006: Hugo, Locus Fantasy, and British Fantasy Awards nominee "A Feast for Crows"
View the full website biography of George R.R. Martin.